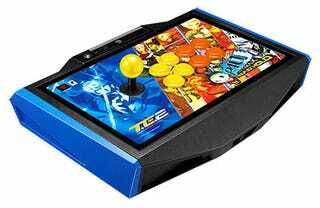 Yesterday on the Persona Channel website, Atlus showed off its P4AU fightstick collaboration with MadCatz. In addition to being completely gorgeous, the announcement states that the fightstick will have a switch to change between PS3 and PS4 compatibility, in addition to the usual stuff we've come to expect from MadCatz's Tournament Edition sticks. So far, it seems like this is a Japan only announcement, and no price or release date has been set yet, but here's hoping for an International release. Why Don&apos;t We Have Smartphone Reviews for Gamers?